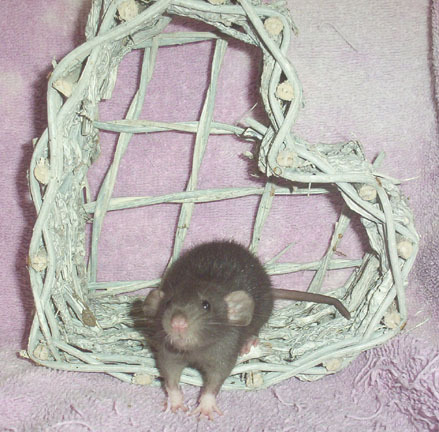 My husband Deron and I have had Fancy Rats as well as other small animals for quite some time now. My favorite (I must admit) are the Odd Eyed Hairless Dumbos. 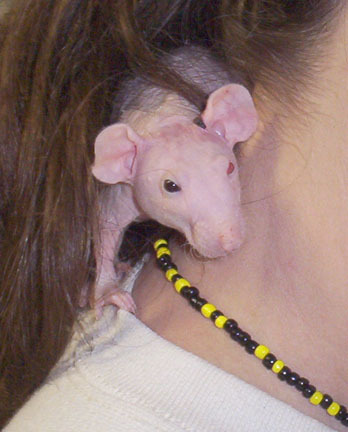 While I have had many Hairless, several Hairless Dumbos, I have only had one Odd Eye Hairless Dumbo. I have had many types of animals and taught tricks to many of them, chickens, a duck, dogs, cats, horses, a guinea pig, parakeets, a cockatiel, goats, ponies are some I have taught tricks to over the years... I love training animals. I have trained sled dogs and lead dogs from a book, and again with books have broke horses to ride. I have had more types of animals then I can probably remember I really enjoy training animals. I am married to Deron Kazmaier who is, among many things, a Mid-Distance Sled Dog Racer. His kennel name was/is DogStar Kennel www.dogstarkennel.com Deron own, trains, run, races and raises AKC Seppala line Siberian Huskies. www.seppalanews.com The joke at our house is that I married the guy with all the dogs and he married the harness maker. We also have other animals and other animal hobbies. We enjoy packing/camping with the horses, goats www.workinggoats.com and llamas www.workingllamas.com... usually that means they all go as well as a few of our dogs on each trip. We call our place in the woods "Grasshopper Ranch" we would rather play the work... so we made our play our source or income. Deron loves computers and is a computer programmer. He created a desk top publishing program in 1985. It is called PageStream www.pagestream.org and we believe it to be the best on the market. I make and sell animal equipment. What I sell, we use. I have designed many of the items myself for the use on our animals. Including but not limited to the outfits I make for Fancy Rats, Guinea Pigs, Hamsters, Gerbils, Mice and well let's see... and dogs. LOL You can see some of the outfits as well as small animal harnesses and other items at www.marnasmenagrie.com. Besides playing Frisbee with a few of our dogs www.upnorthdiscdogs.com (I used to compete). Deron made some regulation Dog Agility equipment for the dogs and I to play with. I had such a good time with that, I got into Fancy Rat Agility. That's right, other species of animals enjoy the same game of agility. See www.rabbitagility.com you might get some more "big ideas" of your own. We own many animals, in fact we have more animals then since or cents. We have animals large and small and I spend each and every morning feeding, watering and cleaning up after them, it takes me about 3 1/2 - 4 1/2 hours. Then any training I am doing begins. Our philosophy is: BREED THEM RIGHT, FEED THEM RIGHT, TREAT THEM RIGHT: We Breed Right and We Feed Right!! I do not breed my animals every time they come into heat. We also are careful about who is breeding who... ie pedigrees. We only (even the mice) breed a litter, maybe two then rest the mother. We pride ourselves on buying quality food for each of our species. My Guinea Pigs DO NOT eat rabbit food, and my small animals do not eat Finch Food. Our birds do not eat dog food, etc. Deron teases me that our kitchen counter looks like "feeding time at the zoo" each morning. I have three baby bottles lined up for the goats as well as paper plates full of cut up people grade veggies for all the small animals and reptiles. We also do not hurry weaning any of the babies at our house. We may give them too much time with mom in some breeder opinions, but I would rather do that then wean too soon.